It may be a hockey term, but when drinking Temptress at the Lakewood Brewing Company, I'm not sure there could be a more fitting name for the taproom than "Sin Bin". I mean, it says right there on the label that it's a beer that "pairs well with sin", so it seems quite appropriate. I bring this up because I happened by the brewery today for a taste of 2013 Bourbon Barrel Temptress (BBT), and let's just say visions of sugar plums were not what was dancing in my head. As for how it tastes, founder Wim Bens thinks it's a better beer than what they put out a year ago. 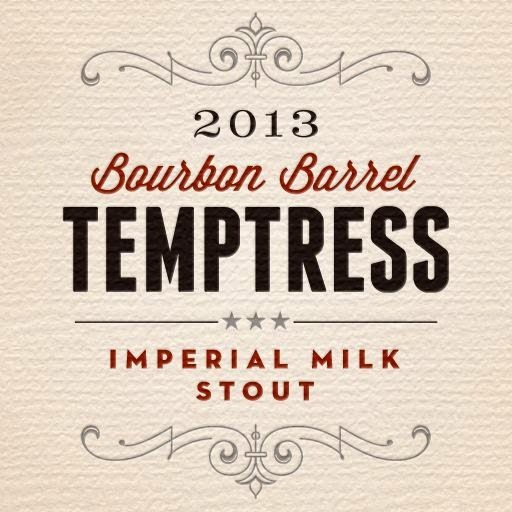 Like the last go around, Temptress spent about six months in Bulleit Bourbon barrels, but Bens was of the opinion that initial tappings of the 2012 vintage were a little hot. This time, he feels like there's a better balance right out of the barrel. He says a fresh 2013 BBT is like drinking last year's version after it had been aging an additional few months. Sampling BBT on nitro, you don't get as much bourbon flavor as you do with standard carbonation, but it's still got plenty of wood character to go with all of the chocolate and vanilla elements we've come to expect in a glass of what is probably the brewery's most popular beer. Ice storm or not BBT makes its debut this Saturday, December 7 at 12 p.m., during Lakewood's regular tour. A single keg of BBT Nitro will also be offered, one of only four that exist for this beer which will also be a brewery exclusive. From there regular BBT is expected to start hitting draft accounts early next week, with around 300 cases of 22-ounce bottles soon to follow.